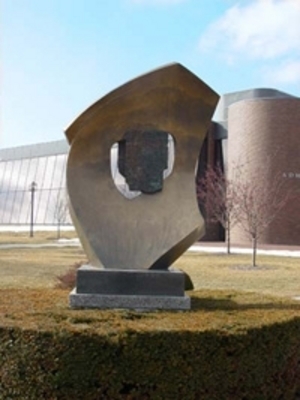 "Class of 1989 Gift -- Bronze Sculpture "Beginnings" by Dr. William Haa"
Class gift of the Class of 1989, with the support of the Class of 1986, the Bryant University Faculty Federation, the Bryant Parents' Fund, and the Friends of the University. The Sculpture was cast for Bryant at the Paul King Foundry. Michael E. Mahrlig, was Chair, Senior Class Gift Committee. Culture and commerce have a common history beginning with one of the oldest known written languages, Cuneiform, which was invented to keep records of trade among the nations of the Tigris and Euphrates Valley, the cradle of civilization about 4,500 years ago.On the tablet on the convex side of the sculpture is a list of commodities for international trade in ancient Sumeria: 2 containers of oil, 3 fish, 4 bunches of onions, 20 containers of fine beer, 11 best woven garments, 5 sheep, 4 goats of coarse flour, 3 horses, 1 donkey, 4 cows that have calved, 10 travelling baskets, 3 pigs. The tablet on the concave side of the sculpture represents a simple prescription of business ethics from the code of Hammurabi, 2250 BC, which reads: "If a builder builds a house for a man and does not make the construction meet the requirements and the wall fall in, that builder shall strengthen the wall at his own expense." These ancient impressions on clay tablets were to their world of international trade what satellite communications are to our world in 1989. Let the future leaders of the business world remember their responsibility to understand the past and to preserve its rich heritage.